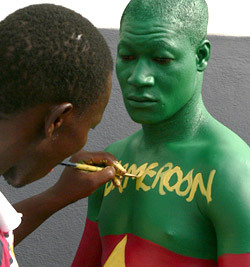 In 1990, in one of the World Cup's best underdog stories, Cameroon became the first African nation to advance to the quarterfinals. But their legacy, and history, is much more complicated than that. The world was watching on June 8th, 1990 as the two teams ran onto the pitch. With the crowd chatting loudly, Argentina and Cameroon readied themselves for the opening game of the 1990 World Cup in Italy. Just by watching the two teams warm up, it was pretty clear they came from very different circumstances. Argentina was football royalty. Winner of the last World Cup in 1986 and two of the last three, they were one of the best teams in the world. The great Diego Maradona led their attack. If it weren’t for Pele, Maradona would have been known as the greatest footballer ever. Heck, even God was on his and Argentina’s side with the infamous 1986 “Hand of God” goal. Lionel Messi's 2007 Copa del Rey goal. You hear people say things such as, “That parking job was a work of art.” The sentence is really just a fancy way of saying you like something. The phrase “a work of art” can usually be replaced with the word “good” to no discernible loss of meaning.